This article is about the normal showdown version. For the Xeno Clash version, see Xeno Corow Clash. Corow Showdown is one of the Normal Showdowns. 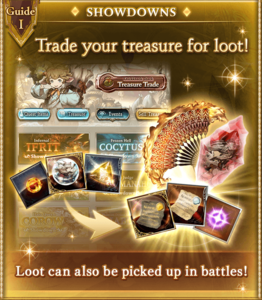 It awards items to trade for the Corow summon. 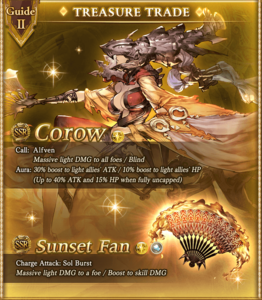 Corow Showdown can be farmed on Hard or Very Hard fairly easily for newer players, allowing them to easily accumulate event items. For newer Light players, unless you happened to draw a good Light ATK summon, getting a copy of Corow to use as your main summon can be beneficial. None of the event weapons are worth spending resources on, so you can use them if you happen to get them, but don't use items to buy them or spend fodder skilling them up. As with all showdowns, you can buy 5 Half Elixirs per month, one per day, and you should be able to get enough materials to buy all 5 each month while using less than 250 AP, so it's worth spending the time to farm materials. 2-hit Light damage to random allies. Light damage to all allies and inflict ?Verification needed. .
and -10% charge bar cut. Base charge diamonds change to ◇. The event shop sells the Corow summon and light weapons. Items restock with higher costs when sold out. This page was last modified on 11 March 2019, at 17:55.